Mosquito-borne viruses have been around as long as mosquitoes themselves, but through aggressive mosquito abatement, the availability of medical services, and other strategic measures, the United States has managed to avoid the catastrophic effects that mosquito-borne diseases and pathogens have had in other countries of the world. We are, however, not entirely safe. West Nile, malaria, and dengue virus claim many lives every year and drive thousands to seek medical attention in the U.S. And the Zika virus, which causes birth defects in unborn children at all stages of pregnancy, is beginning to appear all across the country. Now, more than ever, it is important to understand how mosquito’s bite, and what you can do to prevent bites from occurring. Before we get into what will work to repel mosquitoes, it is vital to understand what attracts them in the first place. Mosquitoes are blood eaters, and they get that blood from mammals. Since all mammals breathe in oxygen and breathe out carbon dioxide, it only makes sense that CO2 emissions would attract them. Understanding this can help you prevent bites. While it may be impossible to stop breathing, it is helpful to understand that breathing out more CO2 will make you more of a target. Whether you are several months pregnant, out for a jog, or lying in a hammock, you will be producing more CO2, and therefore be more attractive to mosquitoes. Mosquitoes have horrible eyesight, so they must rely on things like changing light patterns in order to find their victims. So, the next time you're standing around waving off mosquitoes, remember that your movements actually let them know where you are. Mosquitoes have the ability to detect heat so they can find warm-blooded mammals. They are also drawn to moisture. If you are exerting yourself outside, not only will you be producing more carbon dioxide, you'll also be producing the heat and moisture they are drawn to. CO2 isn't the only thing we expel when we breathe out. Humans expel a variety of chemicals, some of which are attractive to mosquitoes. This may be why you're the one who always seems to get bitten at those backyard cookouts. Not only do mosquitoes zero in on shifting light patterns, they also fly low to the ground and look for silhouettes. For this reason, it is a bad idea to go out in the morning or evening with dark colors on. When you wear lighter colored clothing, you can actually reduce the ability of mosquitoes to detect you. This can reduce bites. 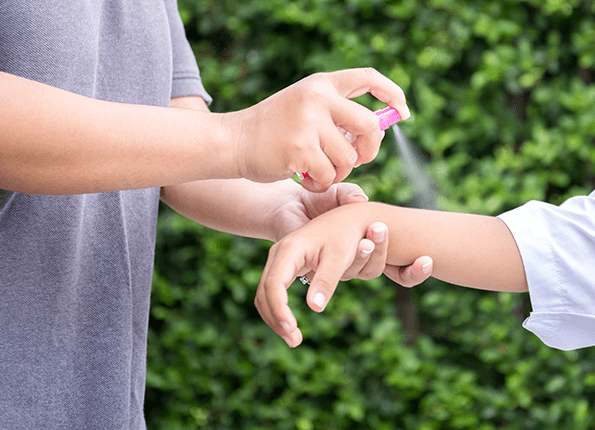 If you must be outside, it is important to understand what repellents can be used to reduce bites. Netting on a stroller will repel mosquitoes and keep your baby from being bitten. Netting is also great for keeping mosquitoes away when you're sleeping in a hammock or mowing your lawn. There are a large variety of nets available. Wearing long sleeves and pants can repel mosquitoes, especially if you are wearing fabrics that they are unable to pierce. Mosquitoes are horrible fliers, so a good stiff wind can keep them away. Consider putting a strong fan outside on your deck if you plan to lie out in the sun. This will repel those little biters. If you want to keep mosquitoes away from your home, make sure all your screens are in perfect working order and that you don't leave any doors open to the outside. The bite of a mosquito can have serious consequences. Protect yourself when you are out and about and consider taking measures to control mosquitoes around your home with mosquito abatement services. The Centers for Disease Control and Prevention puts mosquito abatement at the top of their list of steps to prevent mosquito bites, and you should too. Reach out to us and learn more today.